What are Platinum’s opening hours? Both our Edgehill,St Thomas and Newton,Christ Church locations are open Monday- Friday 8A to 430P. We are closed Saturdays, Sundays and Public Holidays. We also closed for annual stock-taking and for our staff appreciation. We accept Cash, Approved Cheques, Debit and Credit Cards. Are payment plans or credit terms available? We are not equipped to provide the facilties for payment plans or credit. What we can do is provide you with an estimate which you can take to any financing institution to apply for a small loan. You can either use the Email Form by clicking Email in the menu above or you can use the Request a Quote link available on each Product Page. Alternately, you can email us at sales@platinumimportsinc.com. If you utilize the Testimonials or Review Form we will be unable to reply to you as these forms do not capture contact details in order to maintain anonymity. Yes, we provide a 1 year warranty on all plumbing and sanitary ware for manufactures' defects. There is a 3 year warranty on the ceramic washerless cartridge for plumbing fixtures. LED products carry a 3 year warranty for manufactures defects. Warranty void if products not installed by a qualified plumber and/or electrician. Free delivery is available on large items valued over $200. We do not delivery single toilet units that can fit into a vehicle. What brands are sold by Platinum Imports? 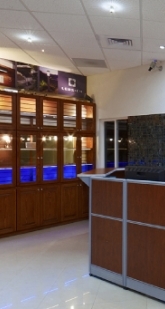 Local retailers of: Eglo, LEDS.C4, Cast Lighting, Craftmade, Hunter, Kichler, WAC Lighting, Nuvo, Eago, FVSA, Halco, Feit, Satco, Bulbrite, Leviton, Insteon, Orbit, Lutron, Tork, Westgate, GE, Intermatic, Southwire, Centaur, Gardener Bender, Contactum, Boeshield. Does Platinum provide after-sales service? Yes, we carry a fully stocked spare parts inventory. Generally, the lifespan of the LED component in bulbs and fixtures ranges between 30,000-40,000 hours. Warm white is similar to incandescent light, with a color temperature of 2700-3200K. Cool white is similar to fluorescent light, with a color temperature of 6000-7000K. LEDs generate a very small amount of heat and are much safer than incandescent, halogen or CFL light bulbs. You can handle them without worry, even after they have been plugged in for days. What happens during a lighting site visits/consultation? We analyze usage and layouts in order to provide energy efficient solutions including personalized lighting layouts and installation. You are also more than welcome to send us an email or give us a call with your feedback.